It is not a pleasant experience to look at Israel's image in the world nowadays, to put it mildly. To the extent the country makes the headlines, it is in the context of the Goldstone report on Operation Cast Lead, the latest outlandish statement of foreign minister Avigdor Lieberman or Israel's continuing occupation of large parts of the West Bank. Israel's negative image is reflected in events such as ambassador Michael Oren being heckled on University of California Irvine campus and deputy foreign minister Danny Ayalon apparently being threatenedduring an appearance at Oxford University. Ultimately Israel's standing in the world hinges on one central factor: the continuing occupation of large parts of the West Bank and maintaining dozens of mini-settlements there. To protect these, Israel maintains hundreds of roadblocks that make Palestinian lives miserable. Binyamin Netanyahu's government has been playing hide-and-seek with the international community about the cessation of construction in the West Bank and East Jerusalem. His only tangible achievement is to have survived his first year in office without a major crisis with the US while keeping his rightwing coalition intact. Looking at this small-time bickering and manoeuvring, most liberal Israelis experience a combination of dismay and often outright disgust. But, as Aluf Benn has pointed out recently, most Israelis feel politically quite apathetic – and Israel's liberals are hardly heard anymore. While I think the observation is correct, I disagree with his diagnosis: I think that the reason for the political apathy of Israel's citizenry is not lack of concern, but fear and hopelessness. In private conversation many Israelis are afraid that Israel will not survive in the long term; that at best it will remain in a state of low-intensity warfare, and at worst involved in bloody confrontations with its neighbours. The contrast between Israel's human, cultural, social, and economic reality and the paralysis maintained by its political class is stunning. First-time visitors from abroad are often surprised: based on what they see in the news they expect a backward, theocratic police state, and instead they find a vibrant, liberal country. They meet outgoing, curious, ambitious people who are open to the world. They see an economy based on entrepreneurship and a cultural scene that is dominated by liberal voices. No wonder they have difficulty connecting what they see to politicians like Lieberman or Eli Yishai whose attitude towards the world is run by deep suspicion, lack of civility and totally devoid of geopolitical sophistication, never mind moral sensitivity. Why then this contrast between Israel's human and cultural reality and its political class? Israel's liberal citizenry has all but disappeared from the political scene: Until the late 1990s, the square in Tel Aviv renamed afterYitzhak Rabin after his assassination was the scene of demonstrations that hundreds of thousands attended: against Sharon after the massacre of Sabra and Shatila; for peace – including the rally at which Rabin was murdered. In the last years Rabin Square has not seen any major demonstrations of Israel's liberals. What has changed, then? For outside observers it may be difficult to understand to what extent Israel's liberals were disempowered by the failure of the Camp David summit in 2000 and the ensuing second intifada. It is difficult to understand how traumatic the continuing shelling of southern Israel after the disengagement from the Gaza Strip has been. For many Israelis this meant that the promise of Israel's left, Peace Now, had been shattered. The prediction that if Israel would offer the two-state solution along the 1967 borders, Palestinians would accept it, turned out to be wrong. Israel's electorate never forgave the left for the failure of this prediction, and all but wiped it out in the last elections. Hence the paradox of Israel's current state of mind: two-thirds of the electorate consistently supports the two-state solution, but the vote goes ever more to the right. 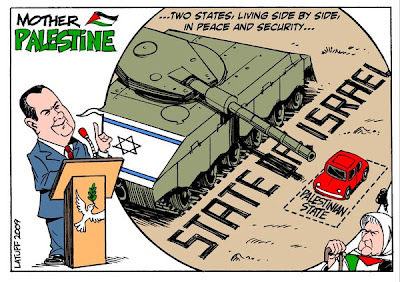 Israelis want the two-state solution, but are deeply afraid of implementing it. As a result they vote for politicians who address their fears rather than for those who offer hope – because they feel there is no hope they can believe in. These politicians, in turn, do everything to further isolate Israel with often boorish behaviour, thus reinforcing Israelis' fears that they can depend only on military force for survival. The result is a form of moral numbness, in which criticism is shrugged off as another one of the relentless attacks on Israel. Is there a potential comeback for Israel's liberal wing? I wish I had a hopeful conclusion, but recent developments are making me ever more pessimistic. Tsipi Livni, who looked like a ray of hope, is having trouble keeping her Kadima party together. Labour leader and defence ministerEhud Barak has taken the last bit of credibility from the Labour party; and the left-leaning Meretz party has become a defunct fig-leaf without any relevance. And while I tend to think that Netanyahu has made a strategic choice for the two-state solution, there is no way he can implement it with his current coalition. The only short-term scenario that could initiate some change would be for Netanyahu to sever his ties with Lieberman's Yisrael Beiteinu party and to form a government together with Kadima based on an unequivocal acceptance of the two-state solution and immediate dismantling of isolated settlements. For the time being the vibrant, creative and liberal Israel that I know continues to express itself in literature, film and music; it continues to work through countless NGOs devoted to causes ranging from supporting Palestinian mental health institutions to ecological initiatives; its creative energies are felt daily in academia and the thriving world of Israeli startups. I hope that it will awaken from its political paralysis before it is too late. Are Muslims allowed to fall in Love? Muslims being butchered in Jos in Nigeria?